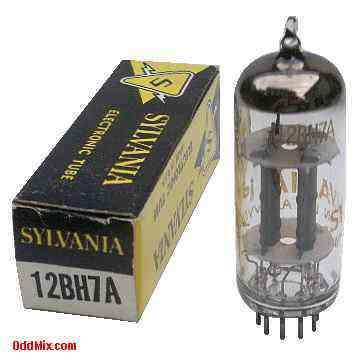 This is an original Sylvania 12BH7A Medium-Mu Twin Triode electronic tube. This tube was developed for vertical deflection amplifier and vertical or horizontal oscillator in television receivers. Also used for amplifiers, multivibrators, oscillators and as amplifier in ac/dc operated radio equipment. This tube is a good general purpose dual triode replacement. It is new, unused, boxed, excellent condition. Useful for antique radio restoration projects or to set up a private vacuum tube museum. First come first serve, as only one of this rare historical vacuum tube available!